I love Attic 24! just recently found and fallen in love with all the great, bright, happy colors of everything she seems to do! Thanks Luana! I'm following you now too!! We have misplaced the spongy foam gizmo meant to keep the cellar door from closing completely; it's to allow the cats (2) access to more area than just the main living quarters. (It's our son's fault. He wanted them restricted from cellar access during our latest vacation; he didn't want to have to go down to scoop the fourth litter pan. So, before we left, I put it away. Carefully. Somewhere! Now, I know what to make to keep the door from accidentally locking a cat away from food and water. Thank you! Hi Jessica-Jean! I don't know how I missed this!! Ours have kept our 5-year-old from smashing her fingers, so a big high-five to you for using these bumpers to protect our 'babies'! Hi Steph! Your blog is AWESOME! I'm going to totally have to try the shower scrubber thing with the soap and vinegar! 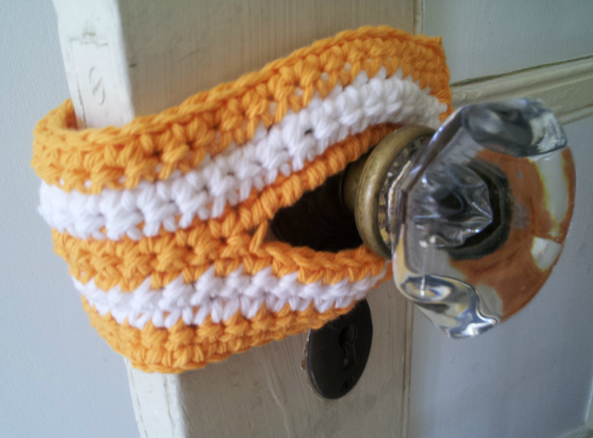 Do you have a pattern for a knit door bumper? Unfortunately I do not know how to crochet. 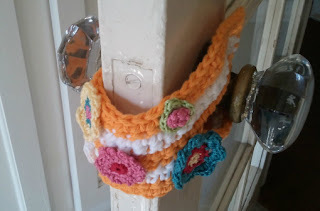 Do you have a pattern for making the little flowers to put on the door bumper? What a great idea. There are several new additions to my family and the new mothers should like these. In fact, our neighbor just found out she is pregnant and I think this would be a unique gift for her as well. I really love this project! I'm not a very strong pattern reader so I know it's my fault but I really just don't understand what's going on with row 10.If ever you make one again could you maybe take pictures of that row or something? Hi Christy! I'm going to try to explain it how I understood it to go! After you crochet the 3 sc in the same stitch in the corner, instead of flipping the work, it's more like you rotate it. Then along the short side of the work, crochet 8 sc sort of like doing a border around it. I ended up doing 9 stitches before I got to the next corner where you will do 3 more sc in the same stitch. Then rotate again and do 32 more sc to the next corner. Then 3 more sc in the same stitch, then 4 more sc along the short edge of the leg. The chain 20 is the part that is tied. Jaime Maraia posted an alternative to rows 5 and 6, though, that might be easier to follow! I hope this make a little more sense!!! Ahaha! Thanks for the catch. That's exactly what I meant! Big squishy e-hug for you! I'm going to fix it right now. I have seen sewing patterns for these. Always wanted to make an attempt of crocheting one. What a perfect gift for new parents. I stumbled on your blog and am so happy I did! I love your attitude and many of your comments. The patterns aren't bad either! :) About a week ago a strong gust of wind blew my open front door to the nearly closed position. My hand was in the path (holding onto the door frame) and I have a large bruise with some tenderness. OUCHIE!! It was difficult for me to knit or crochet until yesterday. Your pattern for the door bumper will come in handy. I'm pretty sure I won't have any trouble remembering to wrap the door bumper around the doors whenever I leave one of them open. Thank you!! I used this pattern tonight (but used chunky yarn and a 5.00mm hook, chaining only 32 instead of 34) and it came out beautifully. Thank you for the pattern; I desperately needed it! So cool for you to think of that. It will be my next project (since I don't have a pet door) they can come in when they are ready. Your pattern goes from Row 10 to Row 12 (continued). Is Row 12 supposed to be Row 11? What are the chain for? I think I did mine wrong. On pic it looks like yours is open on 1 end. I closed my 2 ends in so I just slip both ends over door knob.